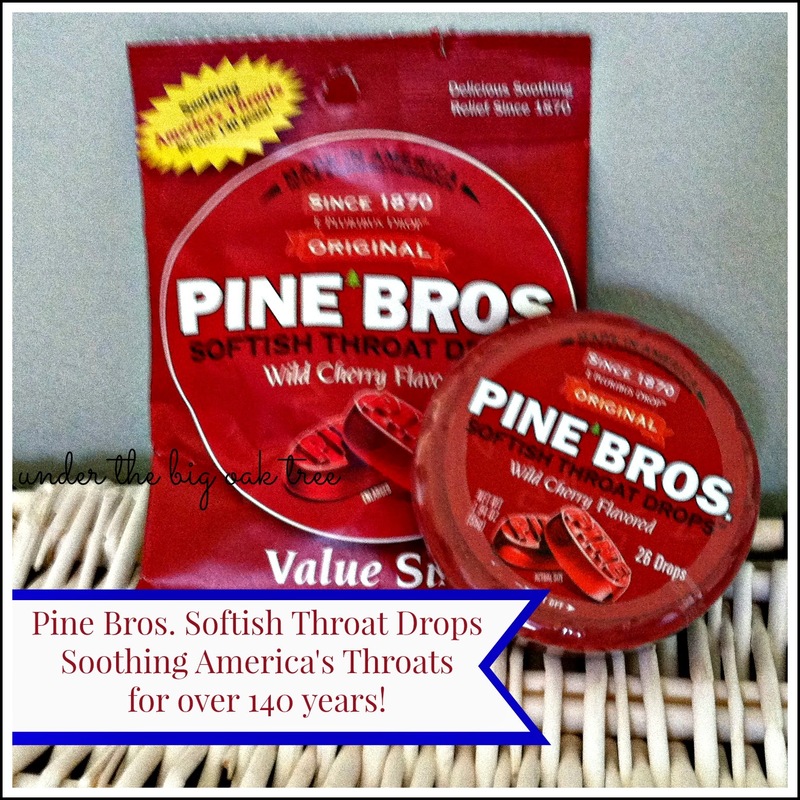 Pine Brothers Softish Throat Drops Soothing America's Throats for over 140 Years! The year was 1870 when Herman Pine (and his brother) sold the first batch of Pine Brothers Glycerin Tablets in my hometown of Philadelphia! Life Savers Company purchased Pine Brothers in 1930 and the drops continued to sell well. Especially in the eastern and northern states where they experience cold, icy winters The site also states that Pine Brothers were most popular during the 1970's, which is when I remember using them. After being sold and re-sold a number of times, along with some cost-cutting recipe changes and production overseas, sales began to decline. Most recently, Pine Brothers has found a new owner. One that has taken the time to find the original recipes and create new packaging with the same classic look. One that has brought production back to America! Pine Brothers was launched nationally in 2011. Now, I'd like to share my experiences with Pine Brothers Throat Drops. Then and now. When I was a kid, I loved taking Pine Brothers throat drops when I had a cough or sore throat. I can still see the box of cherry flavored throat drops on the ledge of my little metal school desk! So much tastier than all of those other products on the market, they seemed like a special treat when I wasn't feeling well. I'm happy that I can now share the same delicious drops with Grace when she has a sore scratchy throat! While we were incredibly lucky this year and skipped a lot of the colds that were going around, I suspect that Grace's allergies will be in full swing this spring and summer. Causing her some throat irritation. She knows to ask for what she calls "medicine candy" when her throat feels scratchy. I haven't tried any of the other flavors, but have always loved the Wild Cherry drops! Since talking to others about Pine Brothers, I've heard many say that they are having trouble finding them when they shop. Here's a link to the "where to buy" page on their website. You can also shop online. Disclosure: This is a sponsored post for SheSpeaks/Febreze. Although, I received samples of this product to facilitate my review, as well as the gift card offered in this giveaway, all opinions and thoughts are both honest and my own. For so many of us, this past winter has been harsh. I don't know about you, but I spent way too many days with all the windows and doors closed while I cuddled on the couch in a blanket. I guess you could say I was hibernating. Now that the days are starting to warm up a bit, it's time to get the screens in those windows and let in some spring time air! With the house being closed up for so many months, the first thing I noticed when we let in some air, was just how much the house was smelling like DOG! From the odor, you'd think we had a large pack of dogs in here, but no, just our one little couch potato was stinking up the place! I wish I would have taken a photo of the Febreze products while they were still in their packaging, but truth be told, we were so eager to give them a try, that we tore into them as soon as our Febreze Spring Collection Kit arrived! So instead, I'll just have to show you the products in action! For the bathroom, I decided to use Febreze NOTICEables in the special edition Sweet Pea Petals scent. 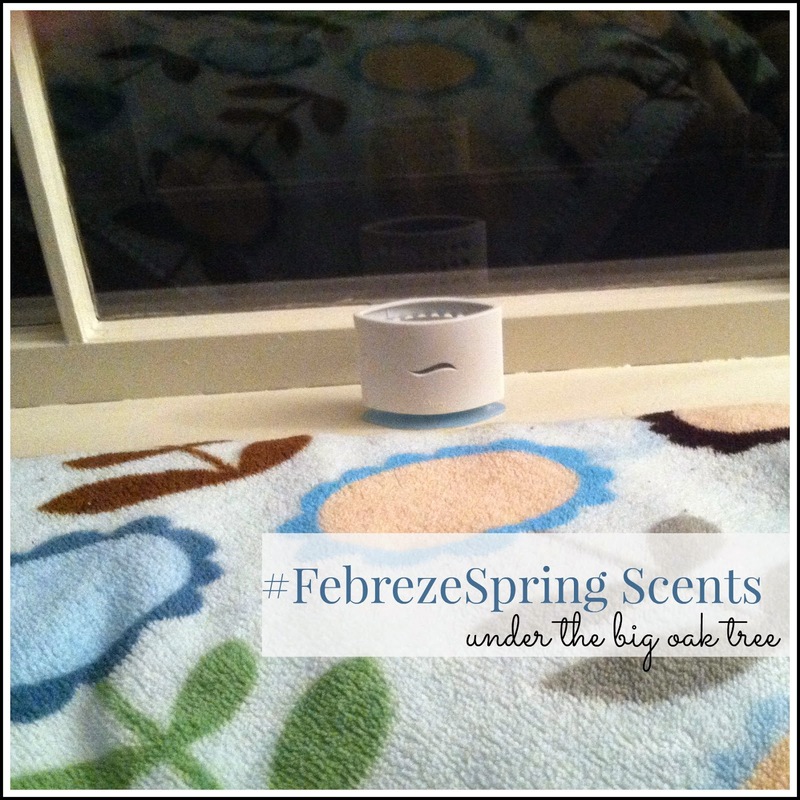 Febreze NOTICEables is a plug-in that uses two complimentary scents to fight odors for up to 30 days! This is a wonderful addition to our bathroom, since we've had to eliminate spray air fresheners from our bathroom now that our very curious (needs to test everything) child uses the bathroom without much help from mommy and daddy. The plug-in feature is great since I try to keep the counter top in our bathroom as clear as possible due to same small, curious child. I also love that we are able to adjust the intensity of the fragrance. In our small bathroom, the lowest setting works perfectly! In the living room, I placed a Febreze Set & Fresh on my windowsill behind the sofa. We don't have too many end tables or other horizontal surfaces in our living room, so this seemed like the best place for this. I love the fresh Rain scent that I received. It smells so crisp and fresh! While this product works best in smaller rooms, the way our living room is boxed off, it is still a good match for that room. And keeping it so close to the sofa, really hides the odors that our four-legged couch potato leaves behind! How can something so cute can be so stinky? My poor smelly puppy! 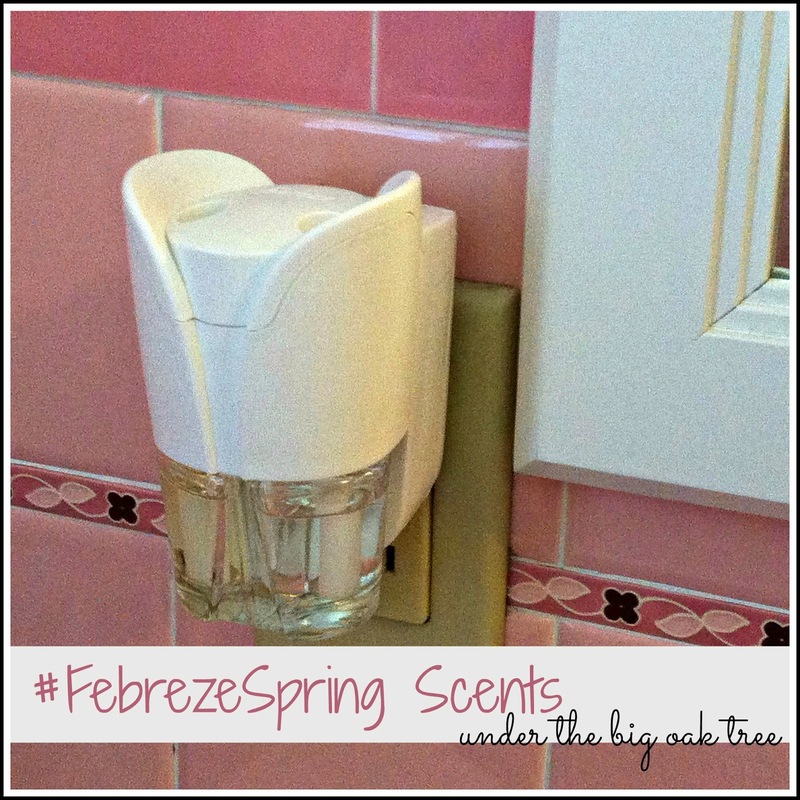 Do you want a chance to give these Febreze Spring scents a try for free? 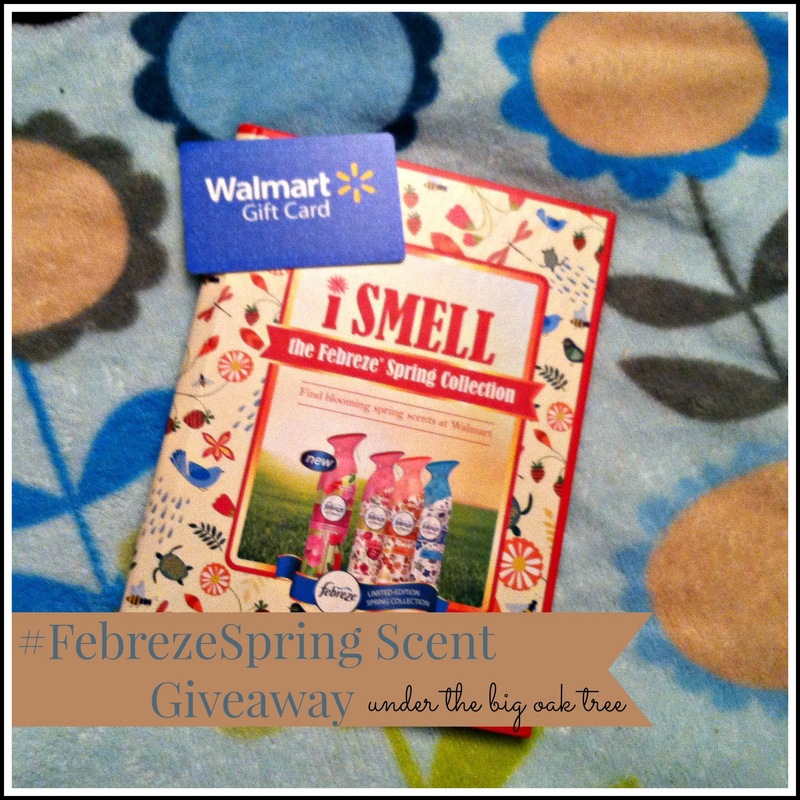 SheSpeaks has provided me with a $15 Walmart giftcard to giveaway to one lucky reader, so that they can pick up the new spring scents! Awesome! Right?